The rain held off until after breakfast but started as we climbed out of Clovelly. The early stages of the day were not hugely memorable: Clovelly disappears at once and the views inland look like a country estate. On your right occasional breaks in the hedge allow you to approach the cliff edge and get a better view of the cliffs behind you and, depressingly, Bucks Mills. It is always a sheer drop. Summer houses are a feature of this section of the path. One had graffiti recording how someone, probably Steve, had done naughty things with Nina in the field above in 1997 and enjoyed it greatly. There was also a carefully inked version of the Doors logo: obviously time stands still in these lands away from motorways and cities. Soon a wooden summer “house” with no walls and detailed carvings, called Angel Wings, appeared. Not long after, we spurned the official path in favour of the SWWA alternative on Gallantry Bower, expecting an exciting walk through a tunnel, followed by a regrettably steep descent. We (or, at least, Andy) felt that we could afford a little extra effort this early in the trip. We missed the tunnel and instead found thick woodland broken up by what looked like poultry runs enclosed in chicken wire, and oil barrels on tripods linked by a long black hose. There was no discernible use for them. The descent is not safe in slippery mud with tall rucksacks. At some points vertical clearance is 4ft, in one case somewhat less under a holly tree. It is steep and slippery with many of the low trees too weak to be used as handholds: some sliding on one’s backside is inevitable. At the bottom, a new problem appeared: rain had completely submerged the stepping stones in the stream. It was impassable and we were forced to retreat until we discovered an 8ft vertical rock face leading down to the beach at Mouth Mill. Extreme rock formations make it an easy upwards climb in dry weather with no rucksacks. Sadly we were going downwards in the rain with packs, which is a slightly different proposition – but we reached the beach, where the stream disappears under boulders and rocks. On the other side we swapped information on path directions with a family coming the other way as the path seemed to evaporate into the yawning depths of a lime kiln. Another climb followed, but it was not long before we dropped into another valley (Windbury – we had seen the waterfall ahead earlier). The path ran back and forth down a featureless steep valley side then crossed a bridge and climbed through woods. We were not making good time at this point and were glad to find four flattish miles ahead to Hartland Point. We had high hopes of the car park but knew realistically that in late April we would be lucky to find anything there. Still, you can dream of tea and toilets with hot air blowers, and we did as we sped up. The rain had stopped being funny long since. This section was fairly flat, fairly featureless, and fairly wet, with lots of field edges and few cliffs. On one we saw a field of cows standing all in lines facing the cliff, their backsides pointing into the rain. We were walking along a narrow path between cliff edge and a single strand of electrified wire, which the front cows were peering over like genetically modified lemmings. If their reaction to seeing us so close up had been to panic and charge through the wire they would have swept us over the cliff and we would have had no chance. Instead a few shied away and the rest continued to stand morosely ignoring the rain driving up their arses. Eventually a “thing that shall not be named” came into view just east of the point. It appears on no maps and is surrounded by fences with “Ministry of Defence property – keep out” signs, so we decided not to take a photo of it. However, we can reveal that it looks like a badly stitched football on top of a concrete pole. Just before it the path gets confusing. For most of the day we had been using stiles that were pretty new – you could tell from the fresh wood. At this point, however, you ignore the tempting new gate across the sheep field and go through (round, really) the battered metal gate collapsing in the corner. Expect nothing from the car park at the point and you will not be disappointed. More path confusion follows as you pass the lighthouse, and then you are in the section rated “strenuous” by the SWWA. This features tremendous scenery, and boiling white waves as the tide rises over the rocks. The rain had lessened very slightly by the long draining climb down into Tichbury Water. Near the bottom we stopped at a fantastic sight: a miniature stone circle perched on the cliff edge. Grey oval stones were slick with rain so that they look like polished hematite. Public art, we suspected. The centre stone is perhaps the size of a large loaf, the ring around it are all bread roll size. We ate lunch standing up staring at it – not a moment too soon as energy was fading fast. At the bottom of the valley we crossed the stream by a wooden bridge, then climbed another steep slope into Smoothlands, a weird lovely valley which is as smooth and curved as a drainpipe sliced lengthways. It’s shallow and we were heading up it, rather than down into it and up the other side, which made it pleasantly unique. However, at the end there is a nasty climb that looked for a moment uncomfortably like it was going to take us straight up the rocky spine of a ridge, like walking on the ridge of a roof, but sloped up at 45 degrees and with loose slates underfoot. Almost immediately steps appeared, but it was nasty moment nonetheless. 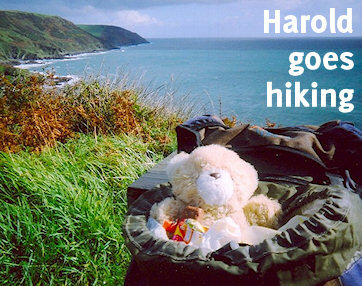 It may have been Hartland Point itself – whatever it was, from it you get the first view “round the corner” at the coast ahead and the hotel. We were seriously underwhelmed, despite the drama of it – the after-effects of the nasty shock caused by the ridge. The Hartland Quay Hotel clings on grimly at the bottom of a cliff, on a spur of rock that juts out into the sea. It’s difficult to see how it’s survived so long in the face of storms. It looked close enough to touch but we were not fooled. There were two valleys to go yet. The next is a drop into Blegberry Water which completely failed to stick in the memory, except as a vague recollection of not being as bad as we expected. We climbed out and faced what the map implied would be the worst valley of the day: the drop down to the Abbey River and the climb up to Dyers Lookout. The slope down was slippery but not too bad. At the bottom a red car was parked right across the path (not that this was a problem, there was plenty of space to pass on each side.) It looked completely out of place, like it had been dropped in by helicopter, even though there was a white cottage with window frames that matched the car nearby. The path detours behind the cottage, perhaps so that walkers don’t spoil the owners’ views, and then crosses the river on a stone bridge which Andy recalls as “freaky” but now can’t remember why he found it so unsettling. The climb out from the valley didn’t look to bad but it was more gruelling than it seemed. We were moving very slowly by now but didn’t care, we were almost there. We passed through a sheep field by a ruined tower, and reached the Rocket House, which is far more ordinary than its glamorous name implies. The route turns down the slope, following a veritable four-lane highway of a path (Lisa’s phrase) and descends a tarmac road (a surprisingly difficult surface to walk on) to the hotel. We discovered a warm welcome, and an offer to wash and dry muddy clothes which was gratefully accepted: boots under radiator, Lisa straight into bath, Andy quick to follow. Paradise. Left Clovelly: 1015. Arrived Hartland Quay Hotel: 1645.